Buying a new air conditioner shouldn’t have to be an overwhelming experience. As the leading AC installation company in Toms River and surrounding communities, Air Tech has everything you need to find the best replacement air conditioner. At Air Tech, we take your comfort seriously all year round. As a proud carrier of Bryant heating & cooling systems, we are equipped with top HVAC products and vast knowledge to perform quality installations. Our Nate certified air conditioning installation experts are fully licensed, bonded, insured and regularly undergo ongoing training so you know you’re getting only the best service around. Let us help you match the perfect air conditioner for your home or business needs. Since 1999, businesses and residents have trusted us to deliver quality service, fair pricing and industry leading equipment. But, we know you probably have some questions about AC installation. Here are a few to help you get started on next steps. How do I know if I should schedule AC repair or AC installation? What should I know about the R-22 phase-out? As you’ve probably heard, R-22 is being phased out due to its ozone-depleting characteristics. In fact, by 2020, R-22 will no longer even be produced. If your AC system currently uses R-22, consider installing an eco-friendly and energy-efficient alternative that uses R-410A. How big should my AC unit be? Contrary to what many may think, larger air conditioners do not deliver more energy efficiency. Many factors should be taken into consideration to find the perfect sized air conditioning unit for your space and maximize humidity control. The AC installation experts from Air Tech have the knowledge and experience to maximize efficiency with the right-sized unit by taking into consideration square feet of living space, layout of the floor plan and code requirements. What is a ductless cooling system and do I need one? Ductless systems are designed to connect an outdoor unit with an indoor unit to heat or cool one specific zone of a home or office without using ductwork. It’s a great solution for homes without a central heating/cooling system or when a room is added or converted to living space. Installing a ductless system is not only easy, but it allows for flexibility in where you deliver heating and cooling. An outdoor unit is placed outside, often at ground level, and is connected to an indoor unit by small cables and a refrigerant line through a hole in the wall. The indoor unit is typically mounted high on the wall of the room and can be set to run automatically or adjusted by a remote control. What is the difference between mini-split vs multi-split? The mini-split ductless system controls one zone, or room, by connecting a single outdoor unit to a single indoor unit. A multi-split ductless system can connect one outdoor unit to up to five indoor units, depending on the model. This allows users to control the heating and cooling in several zones independently of each other. 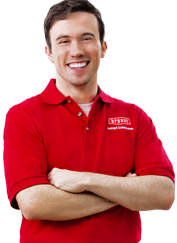 As experts in AC installation, Air Tech can help you decide if it’s time to repair or replace your AC system. Call our HVAC professionals today at 609-246-5905 to find out more about the most cost-effective, energy-efficient option for your Toms River, NJ home or business.